The President of FC Barcelona, ​​Josep Maria Bartomeu, participated on Tuesday in the presentation of the information and awareness campaign entitled, 'SIN RESPETO, NO HAY JUEGO' ('NO RESPECT, NO GAME' in English), promoted by UNESCO and the Spanish media firms PRISA Radio / Cadena SER to combat racism and discrimination in Spanish football. Bartomeu was in Madrid to take part in the event, which was held at the Museo del Traje, and which was also attended by Andrea Agnelli, the President of the Italian football club Juventus, and FlorentinoPérez, the President of Real Madrid, as well as NadaAl-Nashif, UNESCO’s Assistant Director-General for Social and Human Sciences, and JuanLuisCebrián, the CEO of Grup PRISA. 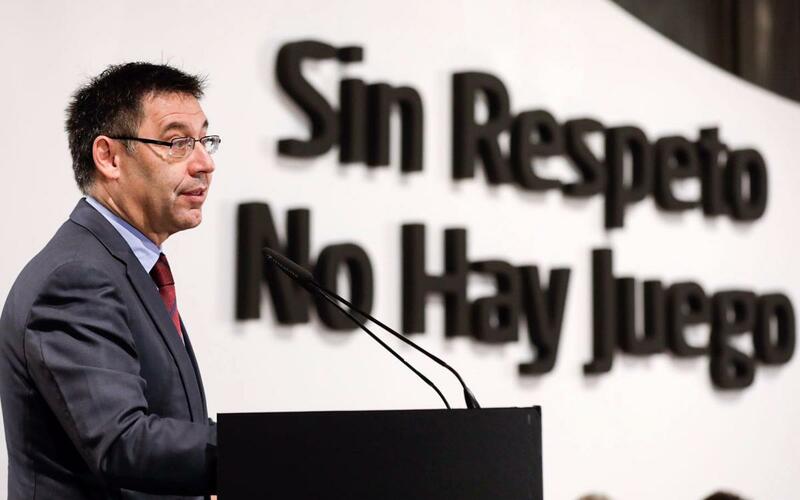 In his speech, Bartomeu reiterated the Club's strong commitment to fighting racism, xenophobia, and homophobia, as well as any discriminatory attitudes that frequently occur in the world of sports and that "as the heads of our clubs, we must not ignore and, instead, must reflect and, above all, act." The Blaugrana President said that "sports clubs should get involved in political debate, but they can send a message to society and, especially, to young people. FC Barcelona assumes this responsibility not only through the Club, but also especially through our Foundation." Bartomeu put forth three ideas: the first is to recognise that we have a problem. The fight against racism must involve awareness and, therefore, education. Promoting projects for our youth, while they are still in school, will help foresee violent behaviour. In the FCBFoundation’s new strategic plan, we have included this key principle with idea of ​​working with the youth of today." “We must not and cannot tolerate the displays of racism that occur in our stadiums." Bartomeu also recalled the incident involving Dani Alves when he was an FC Barcelona player, when he ate a banana that was thrown from the stands at El Madrigal, a moment that led to an avalanche of support from teammates and footballers on social media. “As a club we issued a statement in which we demanded 'respect' and we reminded everyone of UEFA's motto ‘No to racism’. Unfortunately, public condemnation is often reactive once such an incident has occurred. But our obligation is to work every day, with zero tolerance, with clear and powerful messages”. The campaign ‘NO RESPECT, NO GAME’ is the result of a collaboration between UNESCO and PRISA Radio / Cadena SER and aims to give continuity to the spirit highlighted in the international report 'Colour? What colour?' prepared by the European agency on measures to combat racism and discrimination in football. This campaign to disseminate and transfer to the public an awareness of the need to fight against discrimination and racism in Spanish football will take place during the first quarter of 2017. The presentation of this campaign concluded with a roundtable discussion attended by José Ramón Lete, president of the CSD and Secretary of State for Sport; Luis Rubiales, president of the AFE; Lola Romero, director of Atletico Madrid Féminas; Vicente del Bosque, former Spanish national team manager; Michael Robinson, journalist and former footballer, and Marcos Senna, former player and current manager of Institutional Relations of Villarreal. This round table highlighted the importance of education as a key tool to combat racism and discrimination and has put value on the contribution that big clubs can make in order to fight against this problem.